CanMEDS is a framework that identifies and describes the abilities physicians require to effectively meet the health care needs of the people they serve. These abilities are grouped thematically under seven roles. 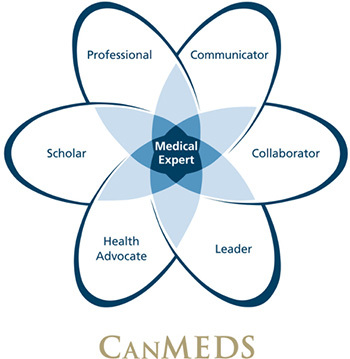 A competent physician seamlessly integrates the competencies of all seven CanMEDS Roles. The overarching goal of CanMEDS is to improve patient care. The CanMEDS model has been adapted around the world, both within and outside the health professions. Officially trademarked, the CanMEDS diagram and framework can be reproduced only with permission from the Royal College. To obtain permission, please complete the form and submit with a copy of your publication to canmeds@royalcollege.ca for approval. Please contact the CanMEDS and Faculty Development Department if you have any questions. The CanMEDS Framework has been integrated into the Royal College’s accreditation standards, specialty training documents, final in-training evaluations, exam blueprints and the Maintenance of Certification Program.